This post marks 126 straight days with a new educational post. With so many folks getting in the habit of using our B&H and Amazon links why quit now? To show your appreciation for my efforts here, we do ask that you use our the B&H and Amazon affiliate links on the right side of the blog for all of your purchases. Please check the availability of all photographic accessories in the BIRDS AS ART Online Store. We sell only what I use and depend on. We will not sell you junk. We know what you need to make creating great images easy and fun. And we are always glad to answer your gear questions via e-mail. This image was created at Gatorland at 6:21pm on March 22, 2014 at Gatorland on a cloudy afternoon with the Gitzo 3532 LS carbon fiber tripod, the Mongoose M3.6 head, the Canon EF 600mm f/4L IS II USM lens, the Canon 1.4x EF Extender III (Teleconverter), and the Canon EOS-1D X. ISO 800. Evaluative metering -1/3 stop as framed: 1/640 sec. at f/9 in Manual mode. Color temperature: 6500K yielded perfect WHITEs (as noted by the RGB values when I brought the image into DPP). Central sensor/AI Servo Surround/Rear Focus AF on the adult’s face and then recompose by pointing the lens down slightly. Click here to see the latest version of the Rear Focus Tutorial. Click on the image to see a larger version. 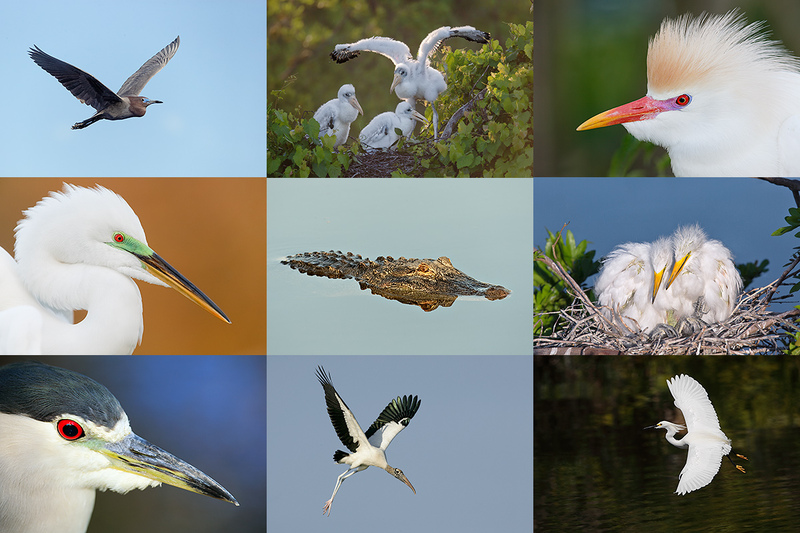 On cloudy mornings or on any given afternoon there are lots of opportunities to photograph the birds and nests on the eastern side of the gator swamp. On sunny afternoons you will have the sun behind you. All of the Wood Stork nests are on that side in the larger trees. 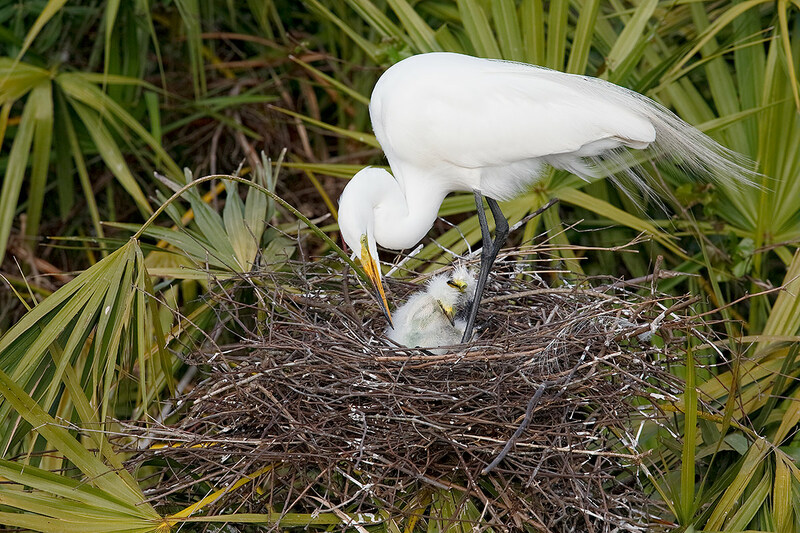 But the herons and egrets like to build their nests in the cabbage palms. #2: What do you think that I like best about the design of this image? #3: Click on the image to enlarge it and see if you can figure out what I like least about this image. #4: After enlarging the image what do you think of the head positions and head angles of the two chicks? #5: With the same gear would you have re-composed differently? Join me at Gatorland for a ton of learning. I will have my flash along…. Click on the composite image to enjoy a larger version. Click on the composite to enjoy the larger size. Saturday Full Day April 5: $399/Sunday Morning April 6, 2014. 7:15am till 10:45 photo session.Lunch, image review, and Photoshop session included: $299. Please note: There is a single opening left on the Saturday April 5 ITF Workshop. But three folks are leaving early; if you are interested in an afternoon only session ($149) or attending on Saturday afternoon and Sunday (morning and lunch)–($299), please contact me via e-mail. You can learn more about the Gatorland In-the-Field Workshops by scrolling down here. The first being that it is a white bird and with the light behind you the scene, especially the birds would be overexposed if using the camera’s metering suggestion. The second reason,…. I have no idea. The fact that it has a clean bottom edge mostly 🙂 and that it is neatly framed by the plants surrounding the birds creating a more loving and motherly feeling to the photo. the white markings on the sticks from the birds. Well that’s what I would like least. I personally think the head positions of the chicks are a bit confusing as it looks like there is only one chick body that has 2 heads coming out from it. I think possibly getting a bit lower personally might create a more pleasing image with regards to the birds and blur the background a bit more creating further separation, but doing so I think you would lose that feel which you have created Artie with the family and tight atmosphere. Hi, Artie. I hate to guess what you liked about the composition, but what I like is the palmetto fronds making an outer frame and the shape of the adult around the chicks making an inner frame. That’s really nice. – 1/3 because you don’t want either to blow out the whites or to underexpose everything else. Again, hard to guess, but the only thing I don’t like a little is the u- or v-shaped twig that starts near the upper chick’s head and points toward the adult’s neck. The image never gets larger when I click on it, by the way. The chicks’ head angles are fine, but would be even better if the lower chick’s head were angled a bit higher and a bit more to its left. I can’t answer how I would have composed without seeing more of what was there. Unlikely that I wold have done better than, or as well as, you did. While the right chick, by turning up to look at mom, showing us its eye, steals and seals the show! A matching image for current breeding season of most of the birds. 3-now I see a small white stick that pokes into the adult’s head that I would like to remove. I wanted to let you know that I received four emails with today’s blog all sent at 8:41am. Every so often, I receive duplicates, but this is the first time I received four. No clue from this end…. 3. I’m not crazy about the leaf branch that appears so close to the mother’s beak. 4. I wish the chicks’ head angles were not so close together and were both looking left or up at the mother. I’d like to see the mother’s eye better. 5. I would have moved the framing to the right a bit, as my eye is not being drawn to the left. #1: Darker than middle tone with bright whites. Second becasue of the incorporation of the flash? #2: The big bird’s head, neck and leags nicely frame the 2 chicks. #3: There is a ‘out of sort’ branch on the front right of the nest? about it is the one beak laying on top of the head of the other. I just think its cute. ‘white stuff’ making up the nest. #4: After enlarging the image what do you think of the head positions and head angles of the two chicks? I don’t see anything wrong with the head angles of the chicks. #5: With the same gear would you have re-composed differently? Same gear? Right now, I’d say no….except maybe moving a little to the left (just a little) to get more head on with the three. 1-The meter will be influenced by all the medium tone around the white so -1/3 is needed to keep white from burning out? 3-The white line of excrement? down this side of the nest?